Do you have more wrinkles than jokes? Try turning 50. Advanced age often comes with some good-natured ribbing and humorous observations. If you or someone you know is turning 50 and can appreciate a few jokes about aging less than gracefully, here are some turning 50 jokes you can share. Your face has more wrinkles than an elephant's backside. You can look back on your 40th birthday and wonder what all the drama was about. You're thankful when someone tells you that you have lipstick on your teeth because it means you still have teeth. You purchase your moisturizer by the case instead of by the jar. Hair dye goes on your shopping list under "essentials" instead of "luxuries." That come hither look you used to have in your eyes just doesn't look as enticing through your bifocals. Your once fabulous behind now looks more like a set of mud flaps. Your hot flashes result in savings on your heating bill. You finally understand that being over the hill beats being planted under it. You now have more hair on your knuckles than you do on your head. You have to use your GPS to locate your feet because you can't see over your belly. Your trick knee goes out more than you do. Your idea of a hot time is putting a heating pad on your bad back. You want your kids' to think you're cool, so you ask them to help set up your own page on MyFace and you can't understand what they're giggling about. Getting some action means all those prunes your doctor is making you eat are doing their job. You and your teeth have decided that a separation is the best thing for your relationship. Punching a time clock is probably the most exercise you'll get all day. Your aspirations toward middle management now involve your waistline instead of your job. Seeking help from upper management is about finding a bra strong enough to keep your bosom from sagging. Being asked "Do you want fries with that?" beats being the one doing the asking. Knock, Knock. Who's there? Half way. Half way who? You're half way through life! Knock, Knock. Who's there? Me. Me who? Oh no, the forgetfulness has started already! What do you call a 50-year-old soldier guarding a building? Half a sentry! Why can you trust your friends more after turning 50? Because you can't even remember each other's names, let alone your deepest secrets! 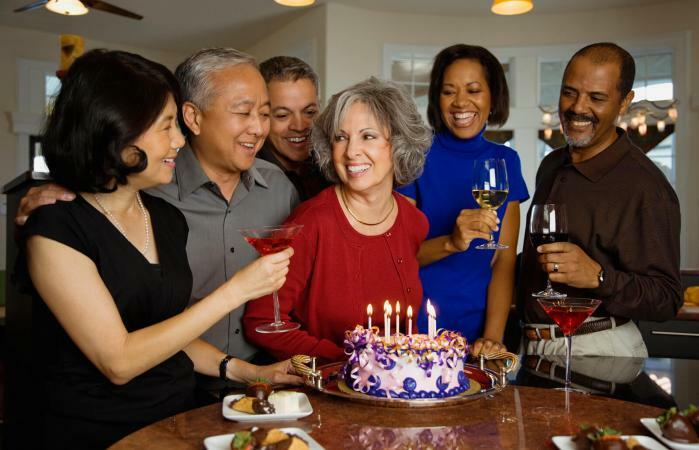 Get your friends laughing with some anecdotal jokes about being old. "It's your birthday? How old are you?" asks the man's friend. "I'm seven and one-seventh." replies the man. "How's that, you look about 50 to me?" asks the friend. "Every time I chat up a nice lady she calls me an old dog, so I figure I get to count age in dog years now!" Person 1: "So you finally made it to the big five-oh?" Person 2: "No, I've never been to Hawaii, but I still love that show!" If you add the two numbers in your chronological age, you get your true age. So you're 5 now, and you can't really argue the similarities. Five-year-olds have a tough time tying their shoes, can barely spell their own name, and need help reading! Need more jokes? Check out the following resources for additional humor about turning 50 years old. What You Don't Know About Turning 50 - This book by P.D. Witte is filled with jokes about turning 50 that are compiled into a funny quiz. BirthdayFrenzy - This website also offers a collection of jokes about the challenges of turning 50. Even the funniest 50th birthday jokes lose their humor if you overdo it. So, stick with a few well-placed zingers instead of lobbing one-liners at the birthday boy or girl all day long. Keep the mood light, and make sure the honoree knows that all the jokes are just a way of showing how much he or she means to you.